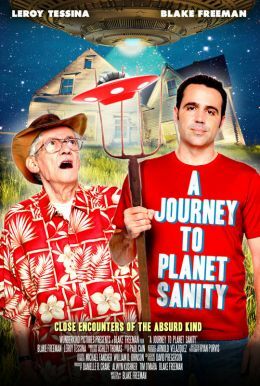 A Journey to Planet Sanity is a reality based (Documentary) comedy debunking aliens, psychics & all things paranormal. The film follows Blake Freeman (Noobz, Mucho Dinero) who takes a 69-year-old man named LeRoy, on a hilarious cross-country journey in search of the truth. LeRoy has spent his life savings on trying to protect himself from aliens and paranormal ghosts by buying gimmicks and entrusting psychics. Upon discovering LeRoy's plight, Blake Freeman with LeRoy in tow, decides to put these beliefs and "so called" experts to the test.